This bike is designed to be agile and quick to get you around town or through the countryside with a road bike style, yet is has some comfortable conveniences not normally found on a road bike. The flat handlebars, adjustable stem, suspension fork and seatpost all lend to taking the edge off the road and makes for a more comfortable ride. This article covers the specifications of the bike along with a video and many pictures that will give you an idea of what this bike is all about. 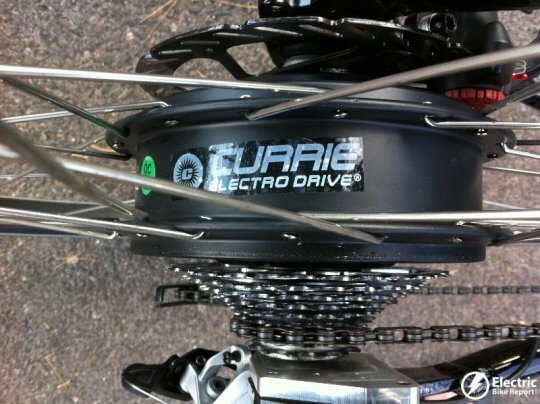 Controller: Exclusive Currie Electro-Drive®, Fully Potted, 36 Volt with Power Gauge Function, Pedal Torque Sensor and Variable Power Boost/Tag Selector. Warranty: 1 year for bike – 2 years for the motor. 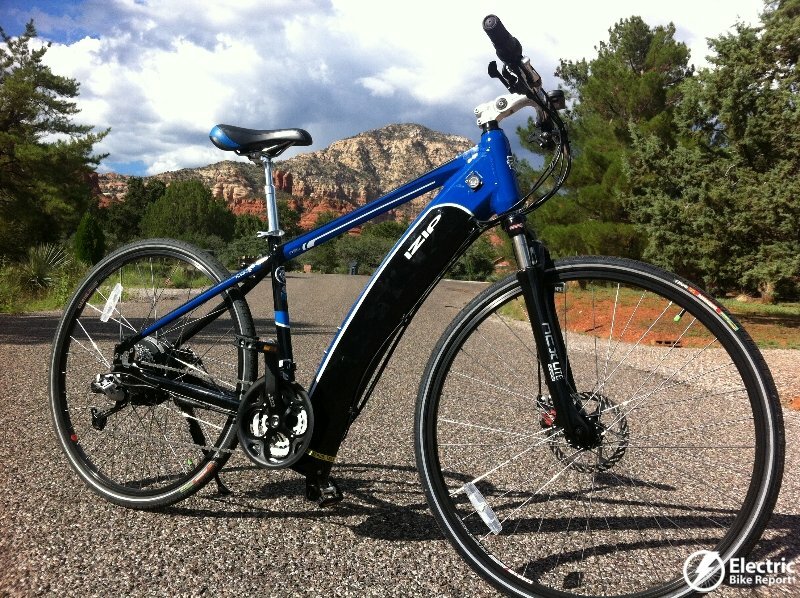 Here is a link to the information page of the IZIP Ultra electric bike. Checkout the video and pictures of the IZIP Ultra! 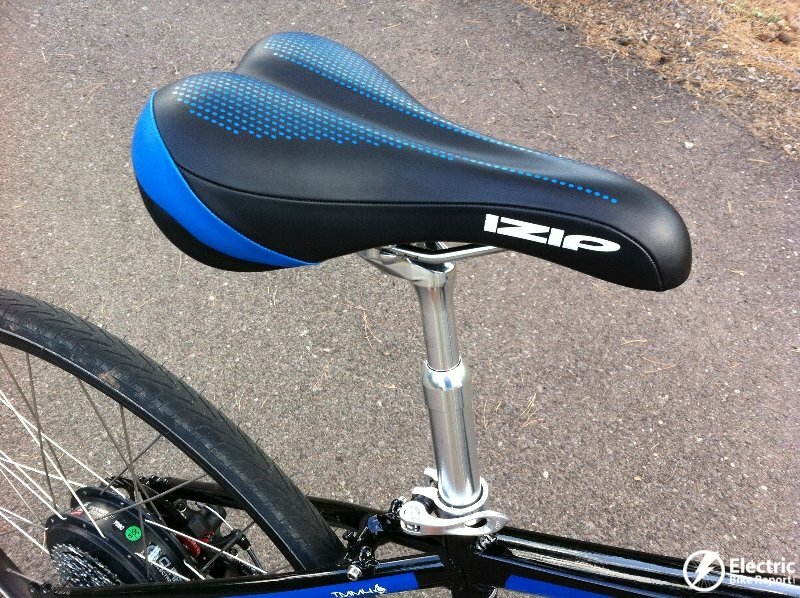 Make sure you checkout the full review of the IZIP Ultra electric bike. Expensive but bike does have a geared motor and disk brakes. I would like to read a discussion of the pluses and minuses of front and rear motors. 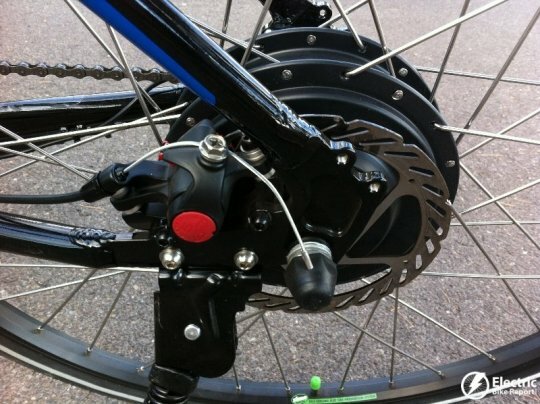 One negative of a rear hub motor is that a belt drive and internal hub shift can’t be used. 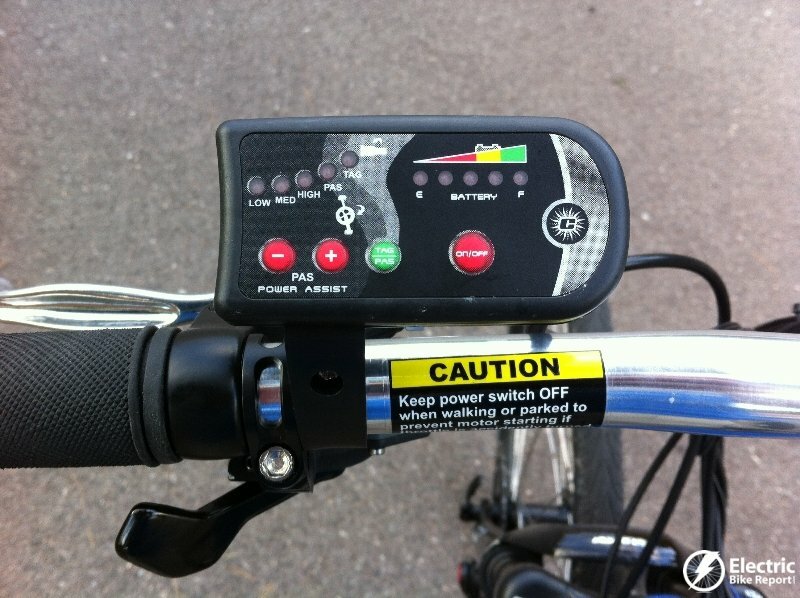 Also, a few years ago when we converted bikes we were trying for 16 and even 20 amp hour batteries with 36 volt motors/controllers but now most bikes are using 9, 10, or 12 amp hour batteries. Are motors more efficient? Are pedal assist devices really good? 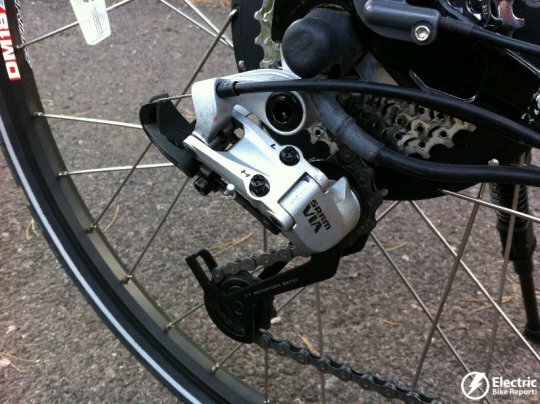 We didn’t have pedal assist on our conversions and I had problems getting gearing that was useful. 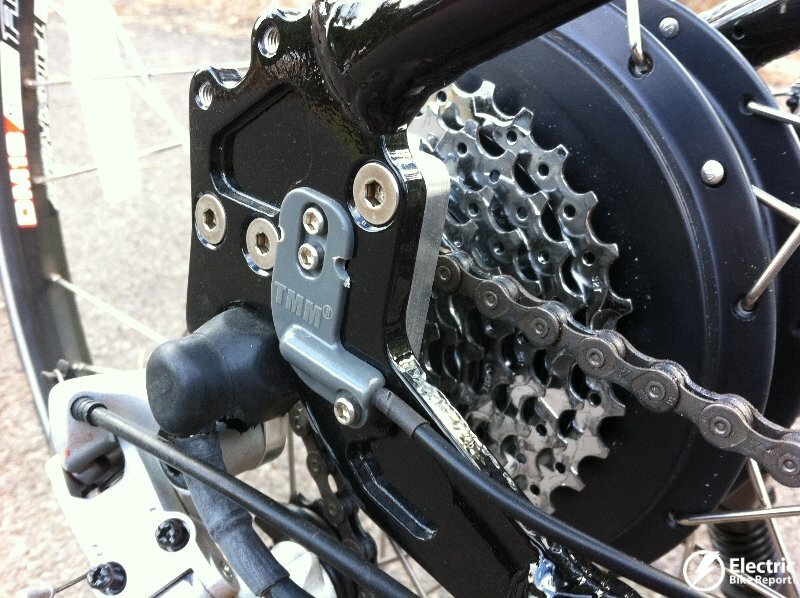 I might have an obsolete 7 sprocket cassette with chain drive but only 2 gears were useful or needed – like 4th to take off and 7th for trying to pedal fast enough to help the motor at 18 to 20 mph. Yes, I changed sprockets on front and rear. I learned to hate chains. 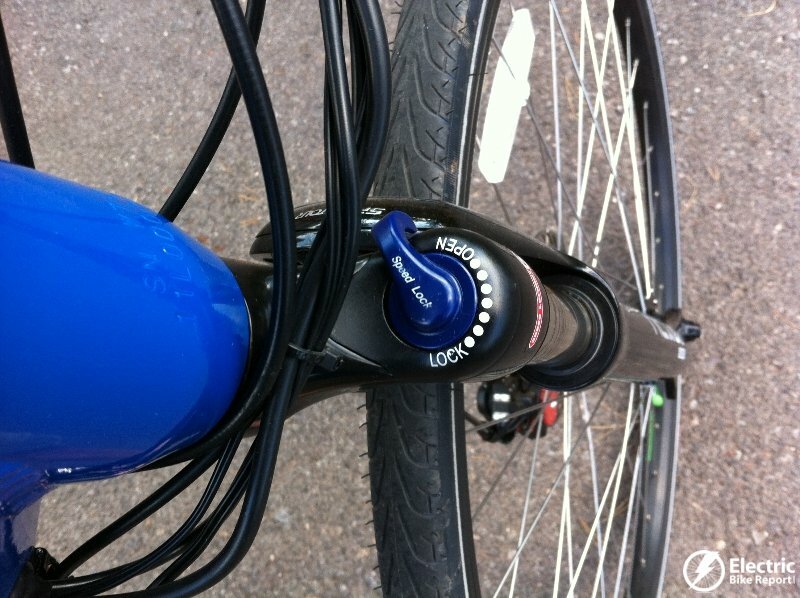 I will probably do a separate article on the pros and cons of front hub and rear hub motors. 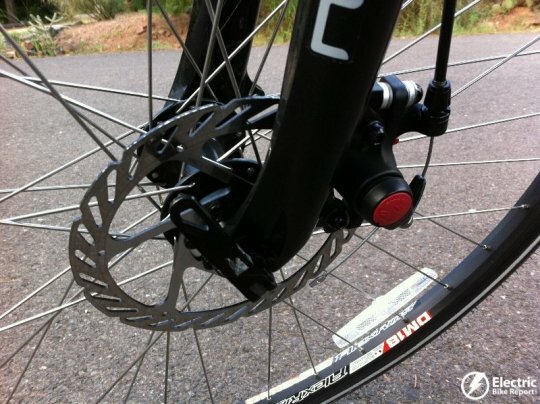 Internal geared hubs and a belt drive is possible on rear hub motors. Please see the video of the Smart electric bike and the video of the Grace Easy electric bike. They are both using Shimano internal 3 speed hubs with a Bionx motor and a Gates belt drive. Pretty cool! Motor efficiency has improved a little but not drastically. 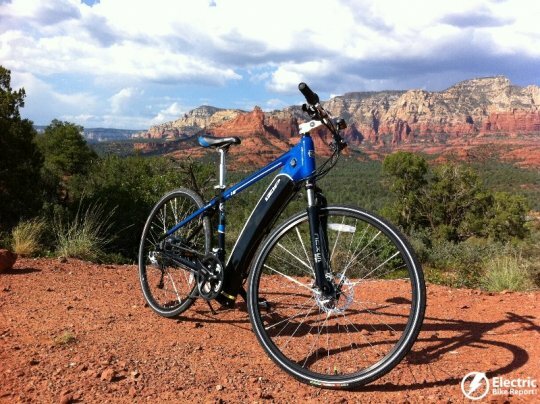 Most e-bikes with a standard 36V 10ah battery pack get 20-25 miles. Pedal assist does make a difference in your range because you have to pedal. This is an eZee Torq clone and does not deserve being labeled as new. 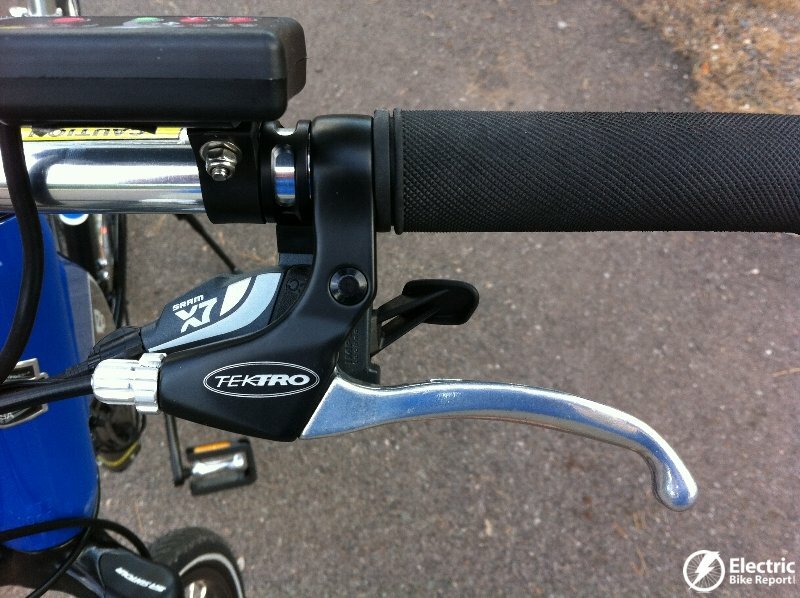 The Torq broke ground with essentially the same format in 2003 and has been in continuous production ever since. Anyone in the industry would immediately realize that they are simply riding on the popularity of that innovation. The Torq is much celebrated, having won the Tour de Prestigne three times, and having thousands sold. 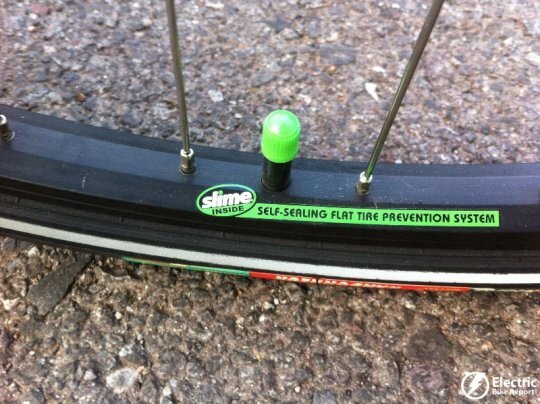 I think to be fair you should mention the real innovator of this bicycle style, Wai Won Ching, president of eZee Kinetic. 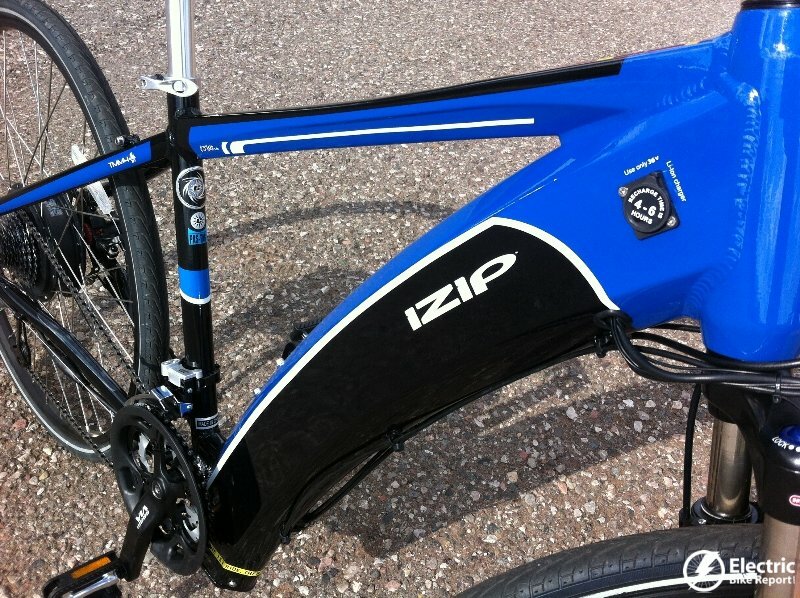 Hi Jace, Thanks for the info, however the IZIP Ultra is very different from the Torq. 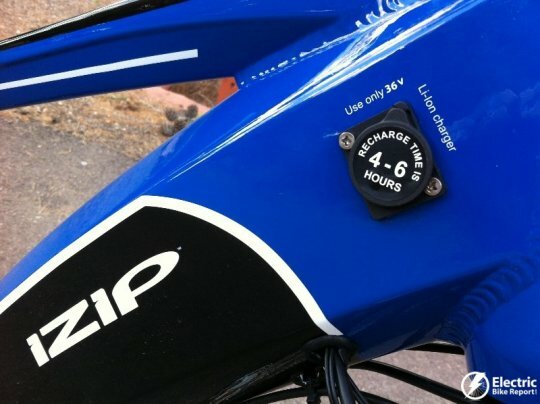 When you compare the specs on the eZee Torq (https://www.ezeebike.com/Torq_product.htm) to the IZIP Ultra, you will see that these are very different e-bikes. Please let me know if I am mistaken. NOT the same thing at all. Both good, but not the same. I agree with some other comments on gearing, you ONLY need two when you have a motor, so lets cut some weight and eliminate. 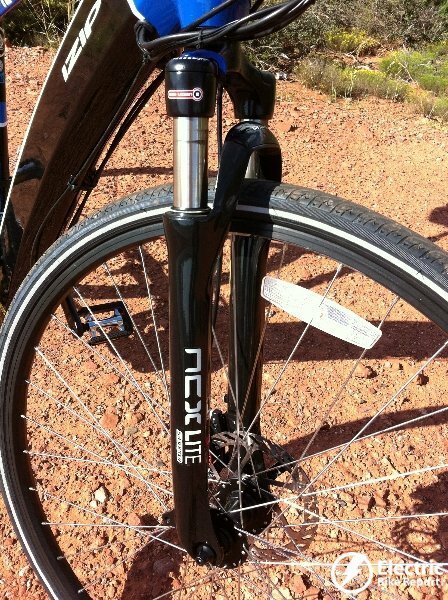 On that note, suspension forks and seat post are not road bike components… I get the suspension fork, it reduces the massive impact loading on the headset caused by heavy battery weight loading a 125PSI tire. I keep waiting for a “ultra light electric road-bike” where is it? 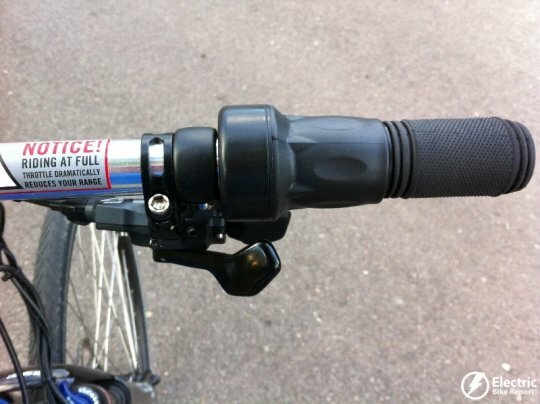 As a Light Electric Vehicle expert and purist cyclist as well I know it can be done. 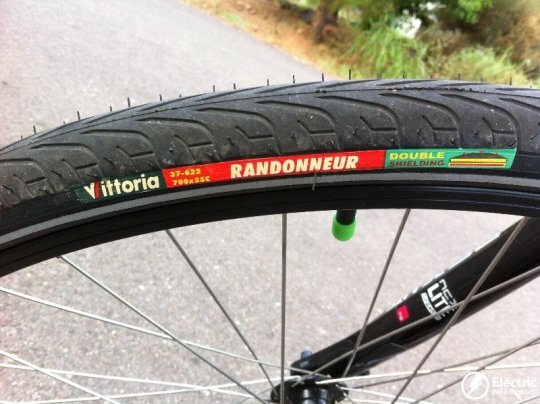 I’m experimenting with two concepts on my road bike now. 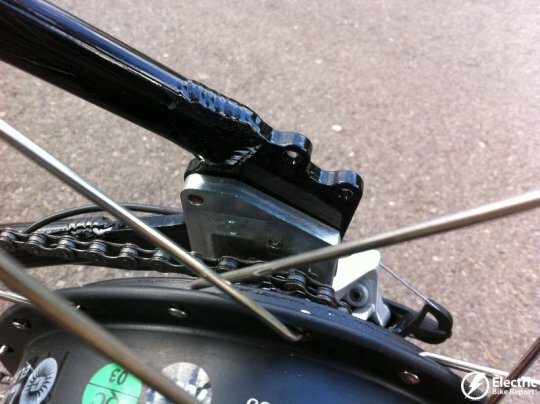 The motor from a JD electric scooter was one of the smallest, lightest and most powerful micro-scooters ever made. I’m trying a friction drive pedal assist on my 1 speed fixed gear (no freewheel) <19lb road bike. If the motor does less work, it can be much lighter. I'm also going to butcher an old Go Motorboard, and use the 1HP two motor tail section with the urethane wheel shaped to friction drive the 700 23c tire. Both of these will be ultra light add-on with minimum battery weight…if I stay at <28Lb (max) total bike weight and only use the motor at peak efficiency to help maintain high speed THAT I PEDALED TO it should work. Although I hate friction drive as a general rule…it does reduce component weight dramatically. I'll let you know soon. Maybe if I do it, with old scooter parts, someone will do it better with technology, and engineering. In the mean time, everyone should buy the IZIP Ultra and enjoy the ride, I know I want one.